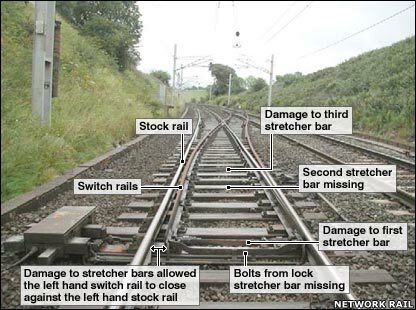 The faulty points that caused a fatal crash in Cumbria should have been inspected five days earlier, a rail industry report has revealed. An 84-year-old woman was killed and 22 people injured when the London to Glasgow Virgin Pendolino plunged off the track at Grayrigg in February. Three days later an interim investigation blamed faulty points. A Network Rail report, released on Tuesday, found systematic failures in track patrolling and management. The report identified a list of deficiencies in inspection and maintenance. It revealed that a visual inspection of the points, scheduled for 18 February, was not carried out because the inspector decided "to finish early". Network Rail said the inspector's records clearly showed that, but the inspector's supervisor then failed to pick up that the inspection had been missed. The report makes 14 recommendations with a further 19 specific action plans to reduce the chance of anything similar happening again. After the accident, Network Rail accepted responsibility and offered apologies to everyone affected. Iain Coucher, chief executive of Network Rail, said: "I renew that apology today. "The report makes for difficult and sobering reading. Mistakes were made and there are important lessons for all of us at Network Rail. "We have already made changes and more change will follow as we put in place all the actions and recommendations put forward by this report." Tony Collins, chief executive of Virgin Rail Group, said: "This is a comprehensive report and clearly indicates some fundamental deficiencies at local level in Network Rail. "It is crucial that we learn from the accident at Grayrigg and it is extremely positive that Network Rail has acknowledged the failings that led to the accident." A Rail Accident Investigation Branch inquiry is still ongoing. 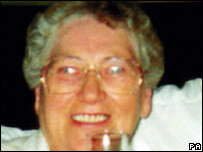 In July, British Transport Police arrested a 46-year-old Network Rail employee from the Preston area and questioned him on suspicion of manslaughter. He was released on bail until 31 October.